BoardGameGeek is a great website and community dedicated to board gaming. It’s the place I visit when I’m looking into cool new games. The site also has a list of the best and worst games based on user rankings. I still have yet to play all of the games in the top 10 – I feel like the universe is actively trying to stop me from playing Android Netrunner. The top ranked game is Twilight Struggle which is a game about the Cold War. It’s an epic game and you ought to play it if you haven’t. Over at Five Thirty Eight, Oliver Roeder did an analysis of Twilight Struggle and what it means to design the best board game on the planet. It’s a good read and touches on a lot of points about good game design. The article even goes into what makes a game “good”. Some of it has to do with design and some has to do with appeasing the way people play games. Simplification, to Gupta and Matthews, was the name of their design philosophy. Rather than overwhelm players with a fat rulebook at the start, the designers spread the information required throughout the gameplay, on cards. 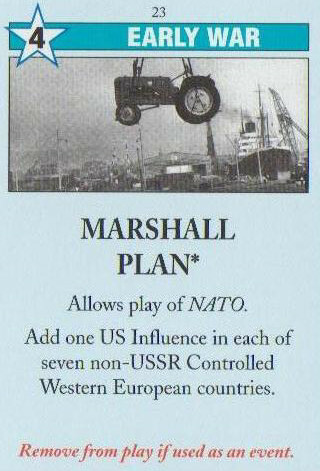 A typical Twilight Struggle card reads, “Truman Doctrine: Remove all USSR Influence from a single uncontrolled country in Europe.” The Twilight Struggle rulebook is a relatively slender 24 pages. “You have to feel like something meaningful has been done in the game. You have to feel like the game had a beginning and had a middle and had an end, and that you were engaged,” Gupta said. You don’t, however, want to get burned out. Twilight Struggle is also an educational game and I found knowing a bit more about the Cold War than other player’s put me at a slight advantage. You don’t need to know anything about history in order to play it though. Over in Germany they are using another one of my favourite games, Battlestar Galactica, to teach aspiring diplomats ethics. It’s an exercise named Project Exodus. The fictional scenario is set aboard the Hesperios — a refugee ship seeking a new home after its worlds had been destroyed in a brutal war with machines disguised as humans. The ship picks up an escape pod: It’s an event which brings the intergalactic war on board. Nobody knows who is really on their side. That’s it. From there the crew have to figure out for themselves how to expose and eradicate the evil among them. In a follow up piece at Five Thirty Eight Roeder looks at the worst games ever made. It’s no shock to see Monopoly and The Game of Life where they are. What I like seeing is that Roeder connects the badness of these games to their overuse of luck. Damn that spinning wheel in Life and the monotony of rolling-and-moving in all those other games. 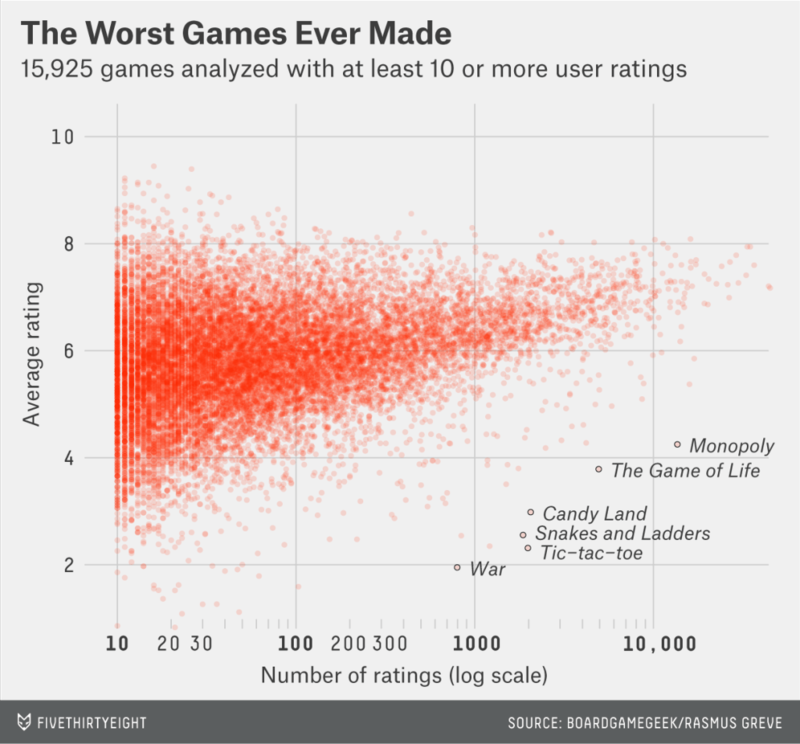 The worst games, for the most part, have one thing in common: luck. They’re driven by it, often exclusively. Candy Land, Snakes and Ladders (also called Chutes and Ladders) and War are driven purely by chance. The Game of Life is close. It’s heavily chance-based, but one can make some decisions.4 Overreliance on luck makes a game boring or frustrating or both. Good games are driven by skill, or, like Twilight Struggle, a healthy mix of skill and luck. You should try your hand at making a board game at next year’s Board Game Jam! Thanks to a ghost for the BSG Germany connection.